In 2011 I was introduced to pastels. Mostly Pastel pencils at that time and quickly discovered that they were great to create realistic wildlife paintings. 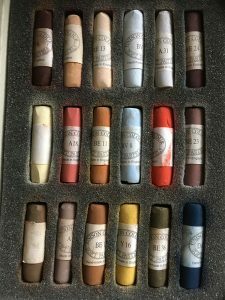 As I gradually became more familiar with using pastel pencils I particularly loved the creamy texture of Bruynzeel, Cretacolor Fine Art Pastel and Caran D’Ache that all have a good range of colours and are perfect for adding fine detail to my paintings such as the eyes, nose and whiskers. 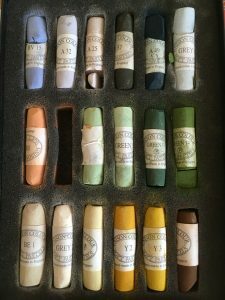 I use Faber Castell’s hard pastels for my underpainting as they create the perfect base layer on which to use Unison’s buttery soft pastels. 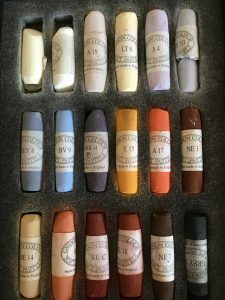 These gorgeous soft pastels can be used like a glaze thus adding the most wonderful depth to my paintings. 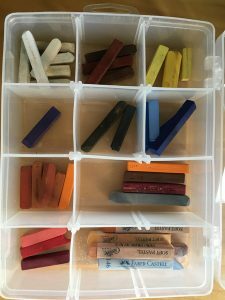 Over time I have found that by using paper stumps, some of Rosemary’s Brushes and rubber tipped tools to rub the pastel into the surface I can paint with them as I did with acrylics, which gives my pastel paintings their own unique quality. Having decided on the animal I want to paint I make a detailed drawing using Jamie’s excellent techniques to establish the animal’s anatomy, the way the hair/fur grows, wrinkles on the skin, shape of eyes, nose and muzzle then adding tone and shadow. I can then transfer this image to my pastel support to paint. I start with the eyes using my pastel pencils to define the colours of the iris and the pupils and the surrounding area and the eyelids. 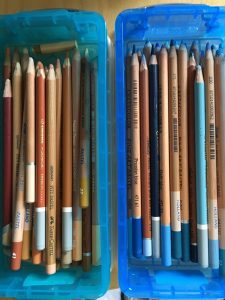 I use my pencils to create the nose to ensure I get all the little crevices in the right place and then I put in the base layer of the whole painting with my hard pastels and add the top layers using my Unison Soft Pastel. 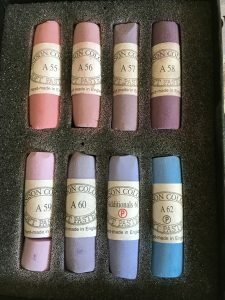 Below is a small selection of my pastel pencils and my Faber Castell hard pastels and my Unison Soft Pastels for Animas, Landscape and my all time favourite colours Heavenly Shadows.